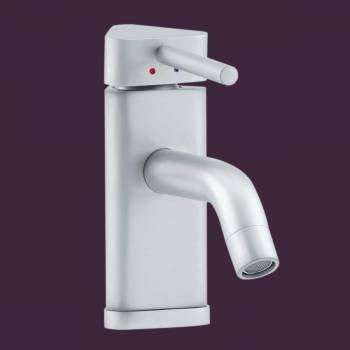 The finest, precision-machined solid brass construction with satin nickel finish, no zinc alloys! Satin Nickel Single Hole Faucets: Renovator's Supply's single lever faucet is constructed of solid brass and has a top rated 500,000 cycle cartridge. This short single lever faucet has a curved spout and triangular body. Faucet comes with supply lines and mounting hardware. Measures: 5 3/4 in. high x 1 in. from spout to counter.